Small Flaw, Big Effect. Acer has come out the with the new generation of Aspire TimelineX notebooks and the series wouldn't be complete without a 13.3" subnotebook. Speedy hardware, a classy design and a long battery life all sound pretty good. 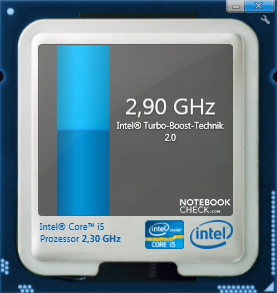 But how does the CPU throttling issue affect this compact laptop's actual performance? 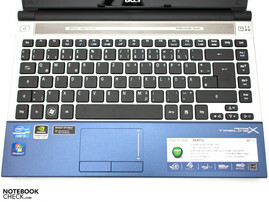 In addition to the Acer Aspire 3750 Consumer Subnotebook, Acer also brings to the table another subnotebook, the 3830TG. While its 13.3" screen (1366 x 768 pixels, Glare-Type) might make it the smallest member of the Timeline series, it doesn't necessarily make it a weakling. 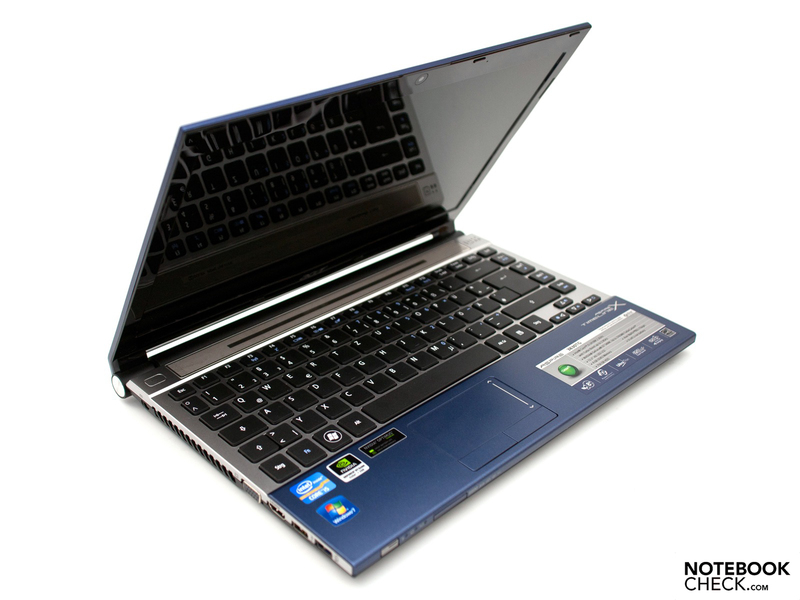 Within the case, the Intel Core i5-2410M dual-core processor and Nvidia GeForce GT 540M dedicated graphics card provide the basis to make 3830TG the "little laptop that could". 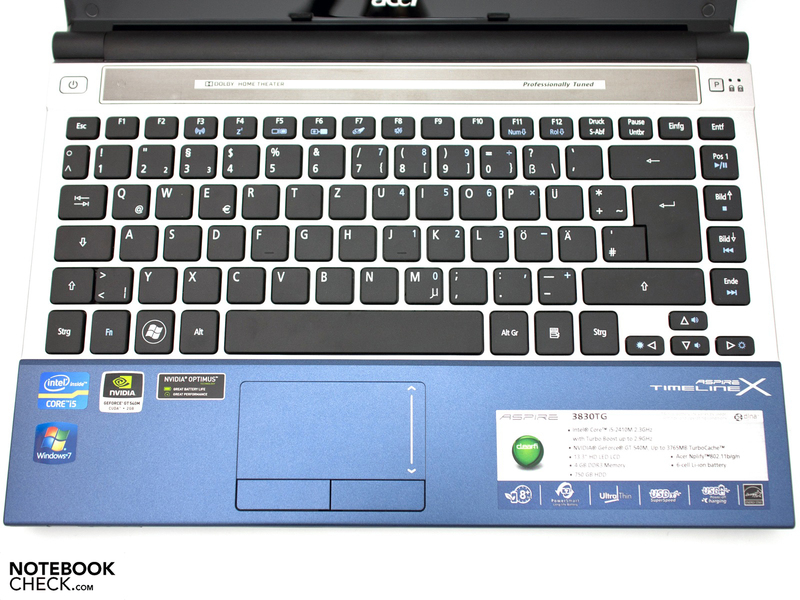 With a bit more cash, you can choose the configuration with an Intel Core i7-2620M and a 120 GB solid state drive (SSD). 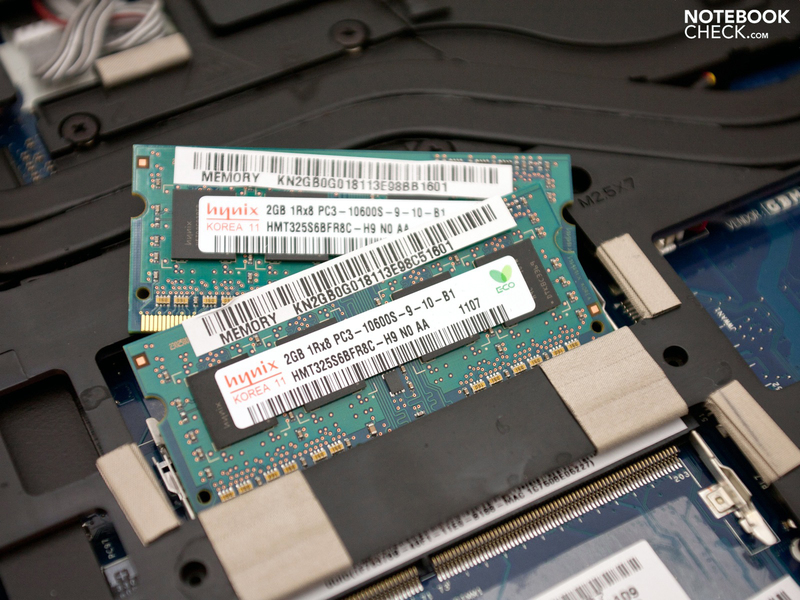 The other hardware found within the Acer Aspire TimelineX 3830TG-2414G75nbb we reviewed: 4 GB DDR3-RAM, an 750 GB hard drive and up-to-date wireless communication components. The laptop currently goes for 799 Euro (RRP). A special topic we paid particular attention to in this review is the issue of CPU throttling, since the previously-reviewed 4830TG and 5830TG of the same series exhibited some problems due to stifled CPU clock rates. The 3830TG has a very modern, yet not-too-flashy look. 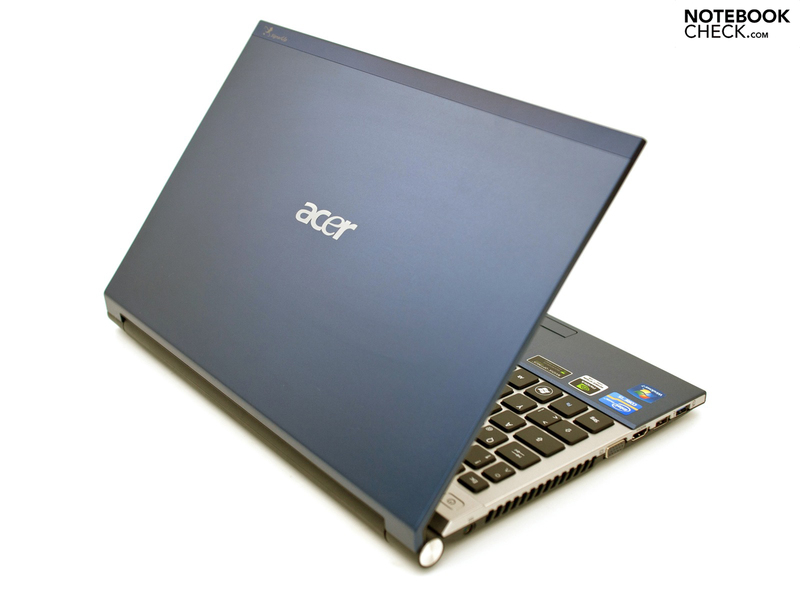 The blue, silver and black color scheme Acer calls "ice blue" is currently the only one available. The plastic surface of most of the case has a good look to it, but the pointy corners really could have been rounded off a bit more. The matte surfaces of the laptop feel quite nice while keeping dust and finger print marks from collecting all over the place. 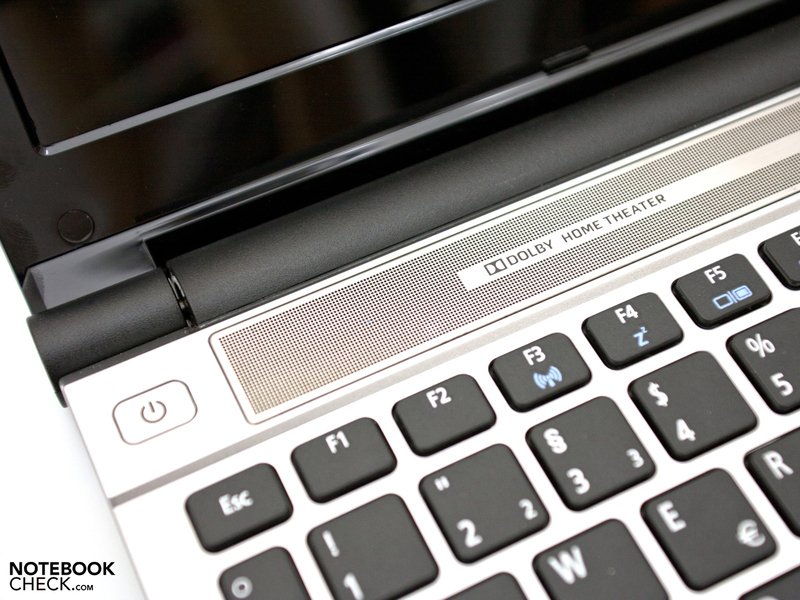 Unfortunately we can't say the same for the high-gloss aluminum display lid. The case overall demonstrates decent quality although the left side of the keyboard and palm rest have a disconcerting spongy feel to them. You'd think the DVD drive were located under here—but no, the runt of the TimelineX litter has no optical drive whatsoever. The case is simply of poor quality toward the left side of the base unit. The display lid hinges are located at the sides and hold the lid firmly in place, which hardly bobs back and forth after you adjust its tilt. 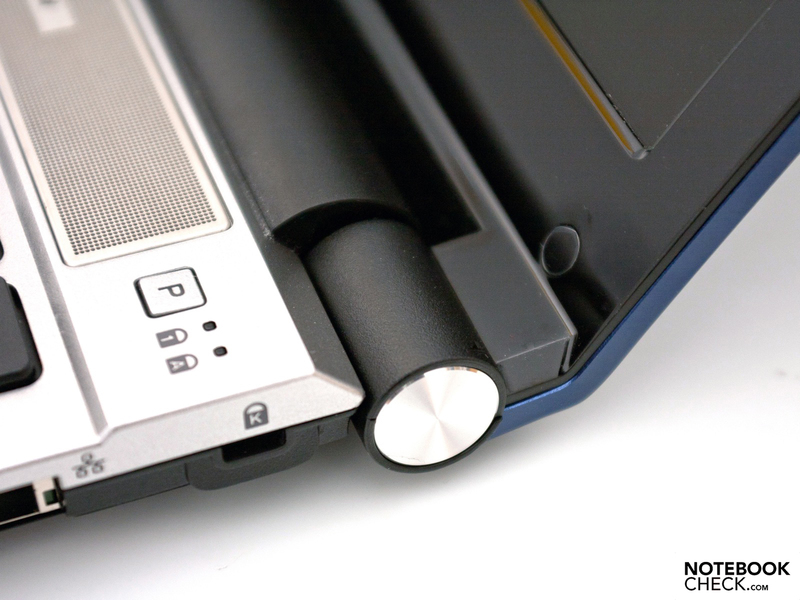 You can open up the laptop with one hand, the base unit lifting up just a bit when you do so. The display lid tilts back all the way to an astounding 155º, at which point the display lid bumps up against the hinges. The matte black base plate consists of a large hatch (leading to the hardware) covered with lots of exhaust vents. The hatch is attached with only one screw, so access to the hardware is only a few turns of a screwdriver away. Under it you'll find 2 RAM slots good for a max. of 8 GB DDR3-RAM, the 2.5" hard drive, part of the cooling system and some empty space for a UMTS module or SIM card slot. The 3830TG has a good variety of ports to offer. Besides the usual suspects like USB 2.0, VGA, Ethernet, headphone jack and the mic input, there's also an HDMI output (supports 1.4a) and a speedy new USB 3.0 port, which can charge peripheral devices even when the laptop is off. 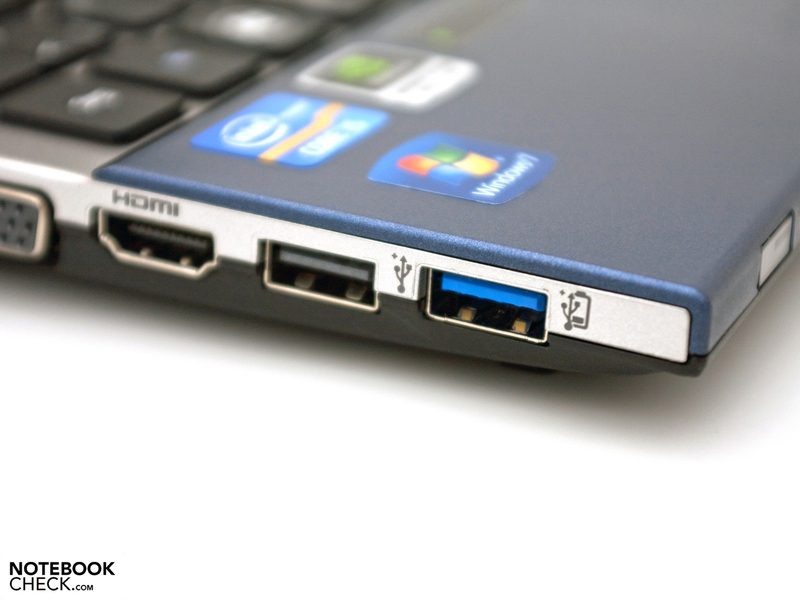 The positioning of these ports is similar to the larger 4830TG, but some of the ports have switched sides. There is no DVD drive built in. A few too many of the ports are located toward the front, leaving little room to move around an external mouse. 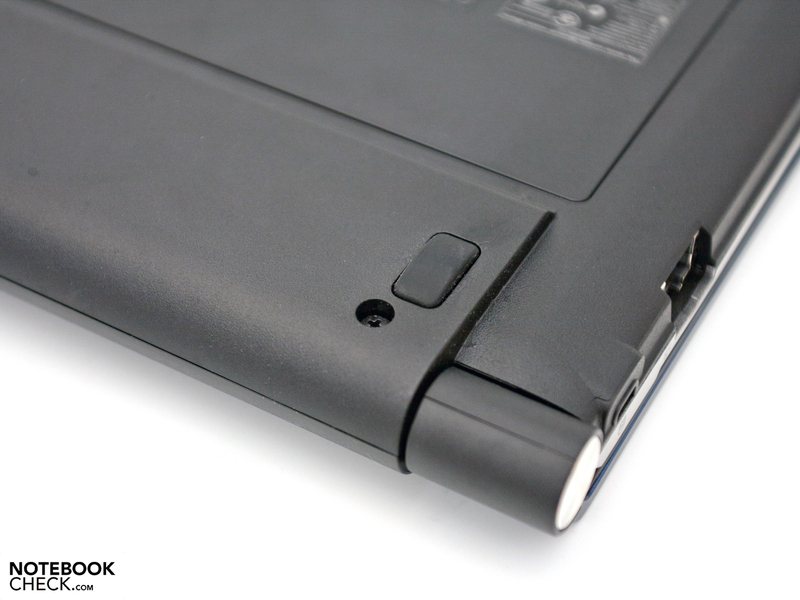 Besides the card reader, there are no ports located on the front edge nor any at all along the back edge. Like with the other models in the TimelineX series, there's really nothing left out when it comes to connecting to the internet. Besides the gigabit Ethernet port, we have the current wifi 802.11b/g/n standard as well as Bluetooth 3.0 +HS. There's an empty space where a UMTS module would otherwise fit, but the model we reviewed did not have a UMTS slot, and soldering in a slot after buying it is also not an option. 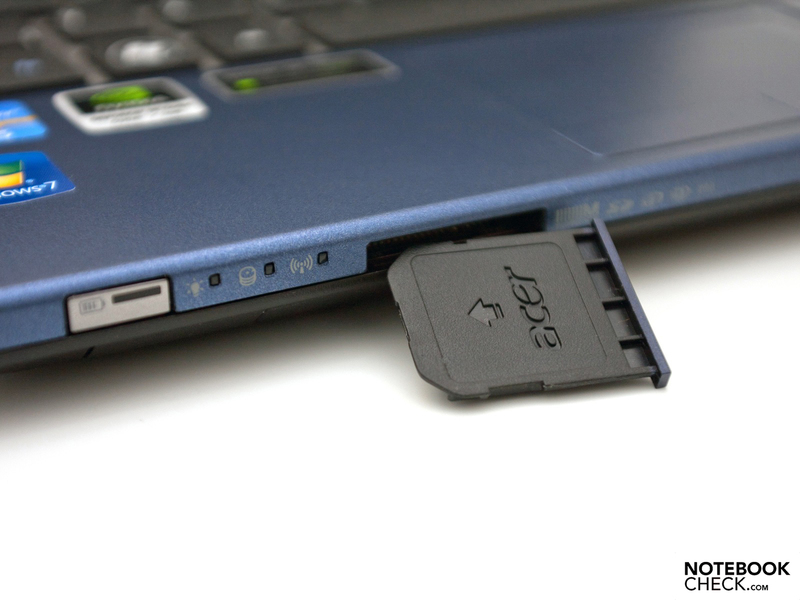 But the 3830TG-2628G12Mnbb configuration of essentially the same laptop comes with such a UMTS slot where a SIM card can be inserted. This configuration costs around 400 Euro more than the one we reviewed but comes with a more powerful CPU and SSD, in return. Not many accessories come with the laptop. Aside from the 90-watt power supply and usual documentation (manuals and such), there's no recovery disc since this data is stored on the hard drive itself. 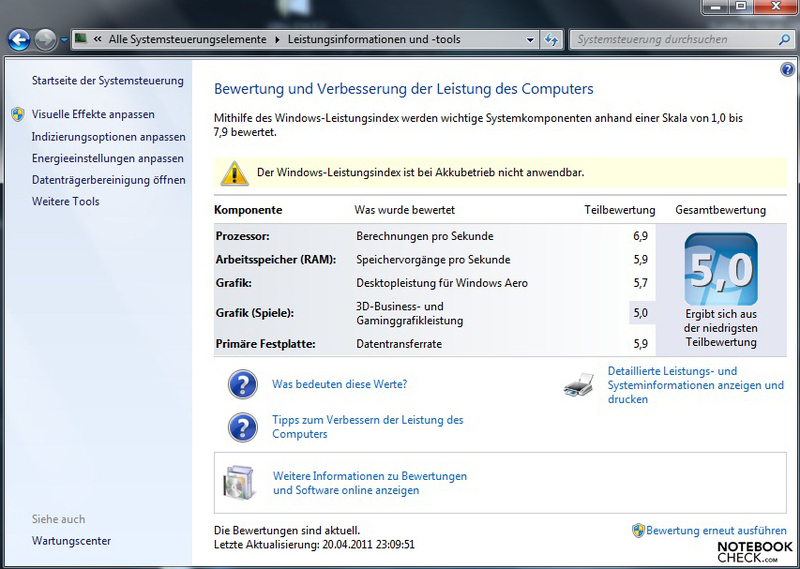 The laptop by default runs Microsoft Windows 7 Home Premium (64-bit) as the operating system. Acer doesn't skimp on the software, pre-installing a ton of software on the hard drive. Of these, however, only Office 2010 Starter, Adobe Reader and Skype are truly useful. The rest of the programs should really be uninstalled for the sake of improved performance. Acer offers a standard 24-month warranty including pick-up & return-service with the International Travelers Warranty to boot (ITW, 12 months). The warranty can be extended to 36 or 48 months on request. Depending on the specific extended warranty package you choose, it'll run you somewhere between 79 and 179 Euro. 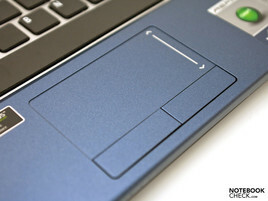 Please find details about the keyboard and touchpad in the review of the Acer Aspire TimelineX 4830TG Subnotebook, which is equipped with the same input devices. Oh glossy screen, who is the fairest one of all? The 3830TG comes in the compact 13.3" form factor, that is, the screen measures 33 cm diagonally, with an aspect ration of 16:9 and a glossy screen (glare-type). 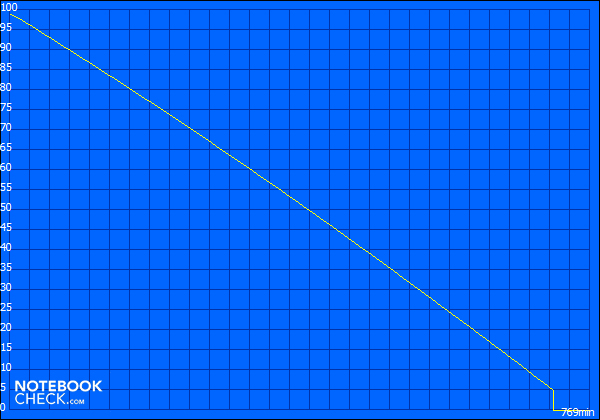 The native resolution of 1366 x 768 pixels is typical for screens of this size. The display is produced by manufacturer AUO (model no. B133XW03) and does not support interpolated resolutions (non-native resolutions). There are two video outputs: VGA and HDMI which can transfer a signal to an external monitor/TV in up to a 1920 x 1080-pixel resolution. The LED-backlit screen has a maximum brightness of 193 cd/m², ranking in very typical. The one praiseworthy aspect of the display would be how evenly lit the screen is—the brightness distribution value comes to 91%. The average screen brightness of 185.3 cd/m² isn't too bad. Displays of significantly higher quality are, however, currently only found in premium-grade notebooks starting at around 1200 Euro. The poor picture contrast of 162:1 and the elevated black level of 1.15 cd/m² are known weak points of inexpensive TN panels. Especially when viewing photos or watching a movie, a higher contrast ratio would be nice. 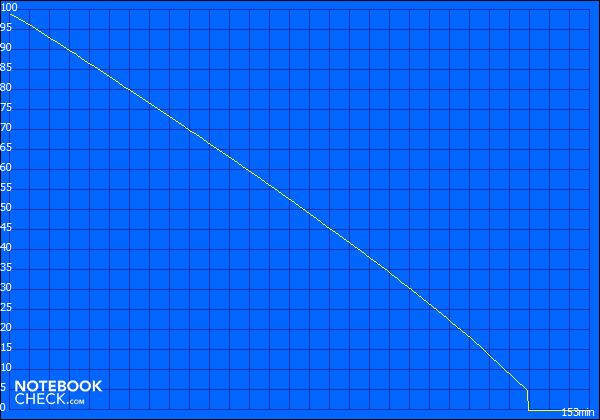 A lower black level would provide for deeper, more saturated blacks. In the case of the TimelineX 3830TG, blacks appear to have a distinct gray tone. 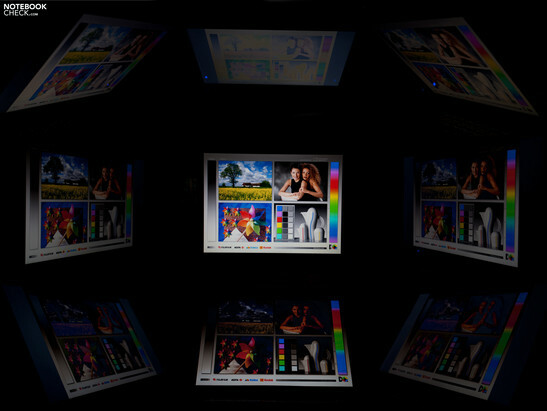 Even though this subnotebook is most likely more appealing for personal rather than professional use, the "Display" section wouldn't be complete without a discussion of the color space that can be displayed on the screen. 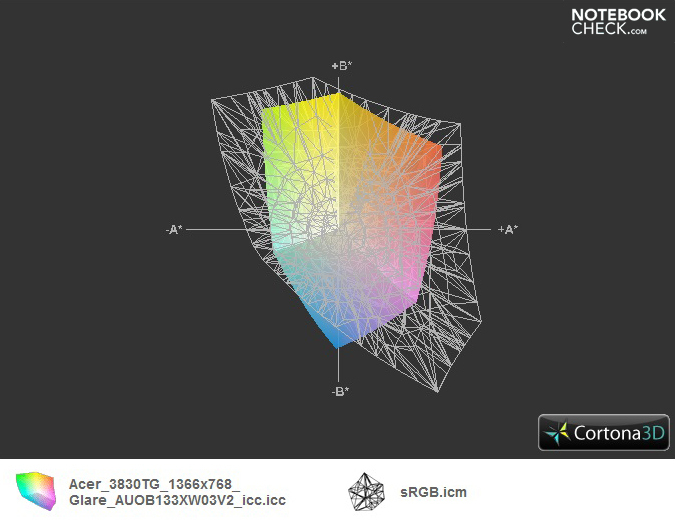 The color spectrum of the 3830TG's screen doesn't nearly cover our reference sRGB color space, placing it among the ranks of inexpensive consumer laptop screens. Outdoor use and viewing angles of the 3830TG's screen can be summarized here quite simply. Even with indirect light shining onto the screen, the picture becomes obscured by reflections of your surroundings and the mediocre screen brightness does little to combat this effect. Tilting the screen back or forward away from a straight-ahead viewing angle quickly results either in an overexposed looking picture or one that resembles a negative of the true picture. On the other hand, when looking at the screen from an angle off to the left or right, the picture remains clear and undistorted even at sharper angles. Acer doesn't venture to install the same hardware in the compact 3830TG as in the larger models of the TimelineX series. The processor in place in the particular model we reviewed is the dual-core Intel Core i5-2410M with a base clock rate of 2.3 GHz, that can jump up to as much as 2.9 GHz once Turbo Boost becomes automatically activated under high CPU stress. 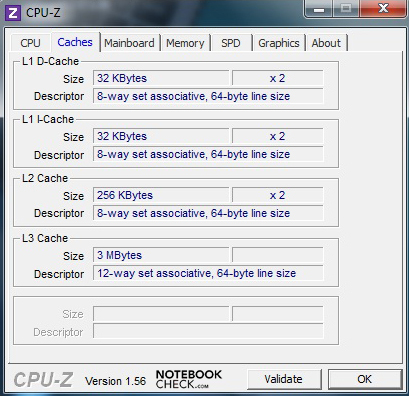 Also, Hyper Threading is supported, allowing the CPU to processes up to four threads simultaneously. 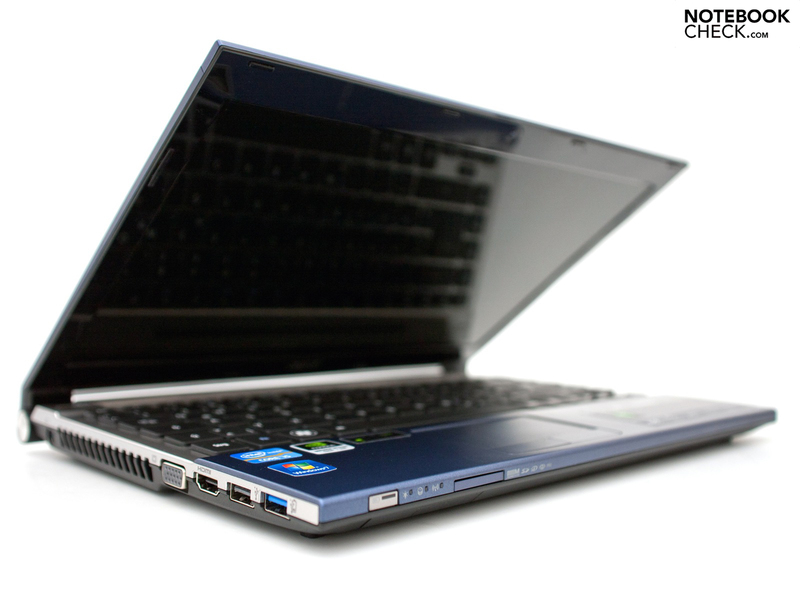 Another configuration of the 3830TG comes with the speedier Intel Core i7-2620M, running at a base clock rate of 2.7 GHz (Turbo Boost: 3.3 GHz). 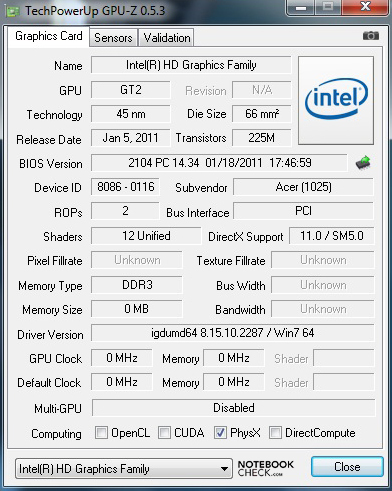 The compact 3830TG actually has two graphics cards. The integrated Intel GMA HD 3000 graphics card takes over for the more powerful dedicated Nvidia GeForce GT 540M mid-grade GPU using Nvidia's Optimus technology. The GT 540M supports both DirectX 11 and Shader Model 5.0. and has 2048 MB DDR3-VRAM, making it quite a powerful graphics card capable of smoothly running most recent games. Before we get to testing out specific games on the 3830TG, a potentially far-reaching problem should be noted: like with the Acer Aspire TimelineX 4830TG, the CPU clock rate drops to 1196 MHz after a short period of time when playing games or doing other resource-demanding tasks on the 3830TG. The very first benchmarks we performed, however, yielded the results we'd expect from a CPU like this—since the CPU was still running at the advertised clock rate of 2.3 GHz. 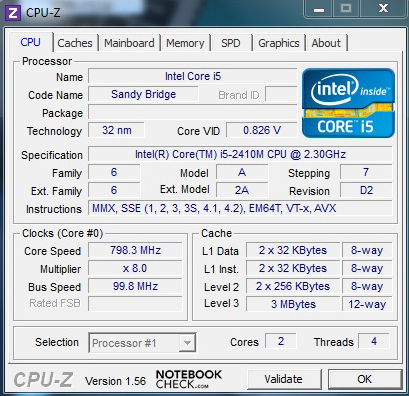 The Intel Core i5-2410M has been through our obstacle course of benchmarks many types, housed within many different notebooks. This time, in Multi-Thread Rendering (64-Bit) in the CineBench R10 benchmark, the subnotebook earned 9651 points—no surprises for this configuration. 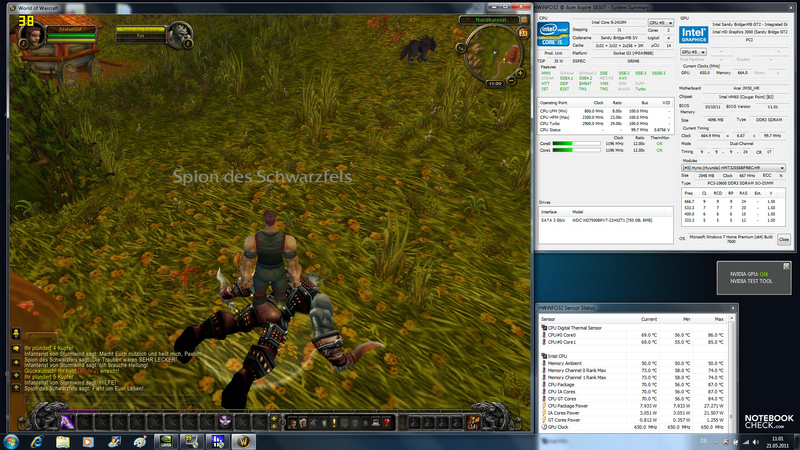 The Schenker XMG A501 with the same GPU but top-of-the-line dual-core i7-2620M performs 14.4 % faster (11279 points). Our 3830TG's predecessor (from the previous generation of TimelineX's) turns out to be only a tad bit slower (11.4%), earning 8556 points. The CineBench R11.5 CPU benchmark shows a similar result. 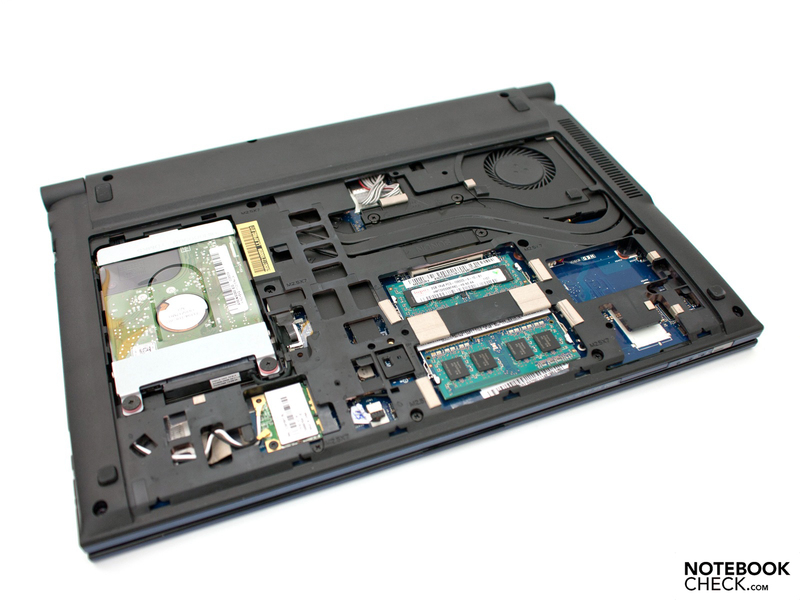 The premium configuration with an Intel Core i7-2620M receives 2.9 points in this test, placing it 10.4% ahead of the subnotebook in this review (2.6 points). The 3830TG still remains around 11.5 % ahead of its predecessor in the paragraph above (2.3 points). In both benchmarks, the mid-grade CPU of the configuration we're reviewing here does not perform too much slower than the premium i7 CPU, which makes the upgrade to the i7 configuration really not worth the extra cost. 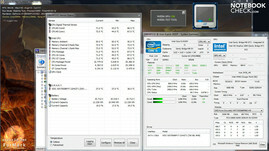 The 3DMark 06 benchmark measured the performance of the Nvidia GeForce GT 540M dedicated graphics card. 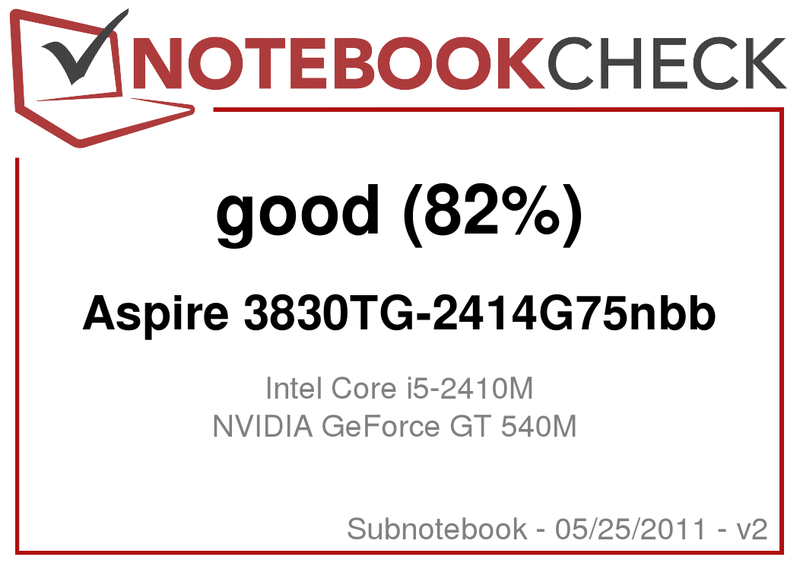 At 7850 points, the GPU shows a pretty good performance but manages slightly fewer points than other notebooks with the same GPU. That's because the processor also affects the 3DMark score. 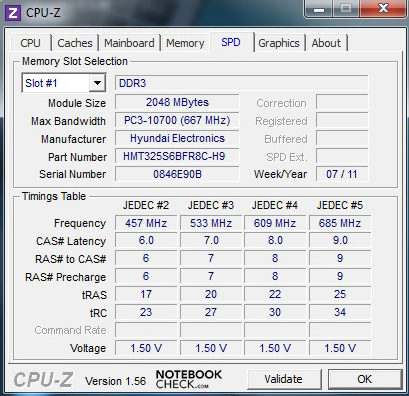 For example, the Packard Bell EasyNote TS-11HR with the same GPU earns 8917 points, 11 % more than the 3830TG. 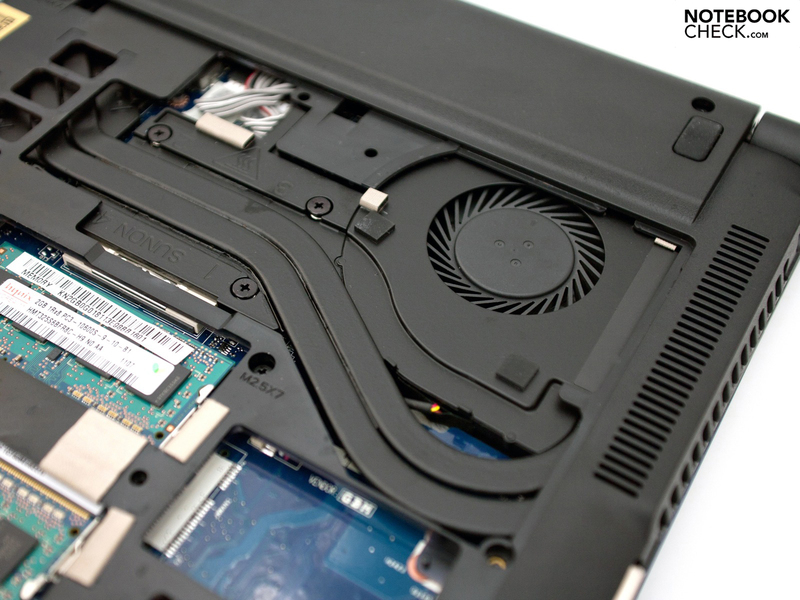 For more powerful performance, we'd suggest the GT 555M, which in the Dell XPS 17 achieved a formidable 11110 points, making the difference between it and the laptop at hand an overwhelming 29.3%. 3DMark 11 gives our GPU-configuration a similar result of 888 points, the Nvidia GeForce GT 555M in the Dell Notebook manages a lead of 22.5 % here (1146 points). With an overall score of 6620 points in the PCMark Vantage benchmark, our tiny TimelineX manages to make it into the top third of our entire database—on par with laptops with similar hardware: among these are the larger TimelineX 5830TG, the new Lenovo ThinkPad Edge E420s and the Dell XPS 15. We don't have too many results in our database yet for the new PCMark 7 benchmark, but the 3830TG managed 1675 points. The current throne holder for this benchmark Alienware M14x with a quad-core CPU and GT 555M. 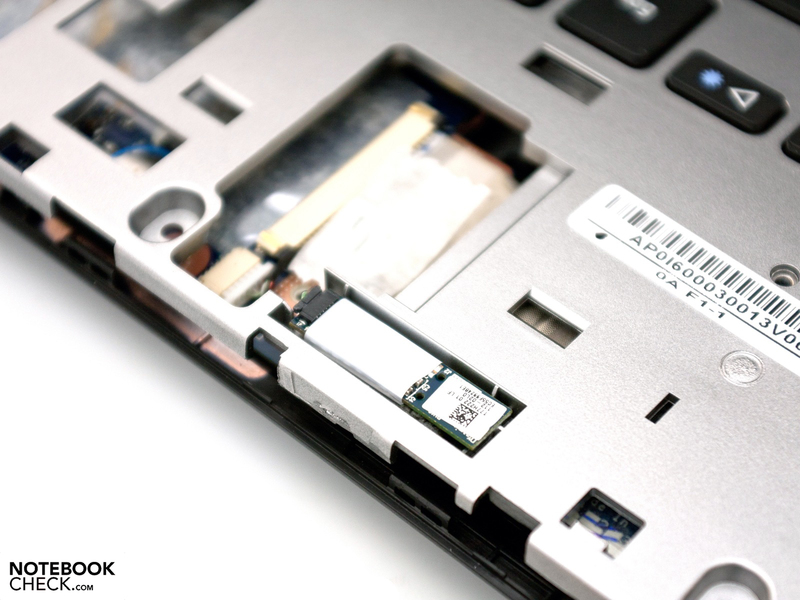 The Acer subnotebook comes with a 750 GB hard drive from Western Digital (Scorpio Blue). Due to its SATA II connection and rotational speed of 5400 RPM, you shouldn't expect extraordinary transfer rates. At a maximum of 92.7 MB/s in the CrystalDiskMark benchmark, the HDD in place here does manage to outdo entry-level hard drives with a 160GB, 250GB or 320GB storage capacity, however. 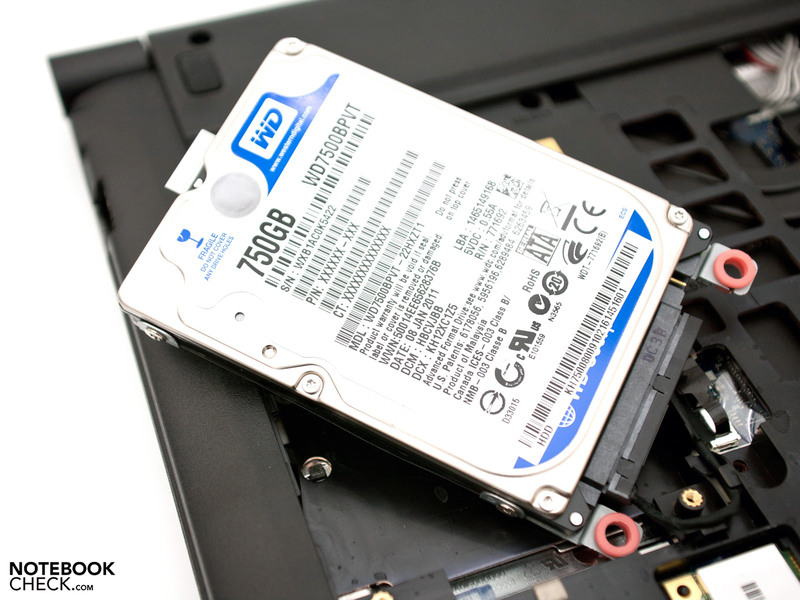 For a boost in performance, we'd suggest upgrading to a Solid State Hybrid drive (SSH) or going for the gusto with a speedy pure Solid State Drive (SSD) either of which can easily be swapped in after purchase. When starting the gaming tests on the 3830TG, we had already noticed the CPU was being throttled like the 4830TG and 5830TG that also had to struggle with this problem. Earlier, when performing the above-mentioned benchmarks, we observed no throttling and the hardware temperature also remained within bounds. But once we started running some games, the frame rates quickly dropped and the CPU clock rate dropped to 1196 MHz. The tool we used to read the hardware temperature does not, however, measure the temperature directly and is therefore not incredibly reliable. We can nevertheless exclude the possibility of the throttling stemming from overly high temperatures of 100ºC (max GPU temp) or 105ºC (max CPU temp). The problem here stems from Acer's BIOS settings. The Nvidia GeForce GT 540M GPU with 2048 MB DDR3-VRAM is a very popular mid-grade graphics card just fine for smoothly running most newer games. Due to the CPU clock rate dropping, the in-game frame rate drops right along with it, making the 3830TG's performance seem rather poor when compared with similar configurations without throttling. Except for TrackMania Nations Forever—which we nevertheless ran for a very short while—all the games exhibited a drop in frame rate. 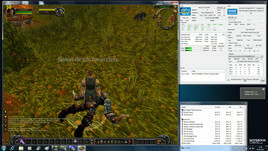 World of Warcraft runs smoothly for the first minute or two at an excellent 113.2 fps with the "fair" graphics preset—which is pretty normal for this GPU. Then the frame rate suddenly drops to 66.1 fps. This adds up to a 41.6% reduction in performance and—except for some deviations of several percent—this is true for all the other games we ran on the 3830TG. 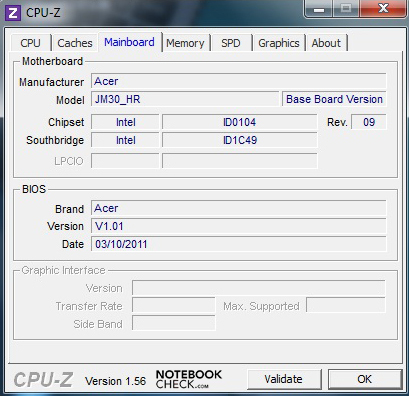 Recently Acer published the BIOS Version 1.03 Update, the change log and brief function test of which showed no improvement of this problem. Likewise, the Tool ThrottleStop 3.00 from Tech|Inferno is a piecemeal solution that attempts to keep the temperature in check by lowering the maximum clock rate. 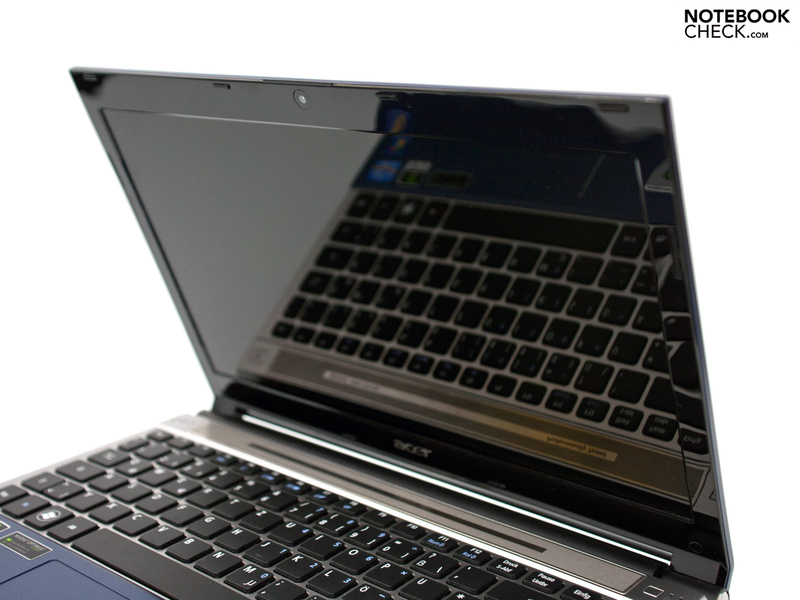 We're looking forward to a full-fledged solution from the Taiwanese manufacturer, Acer. 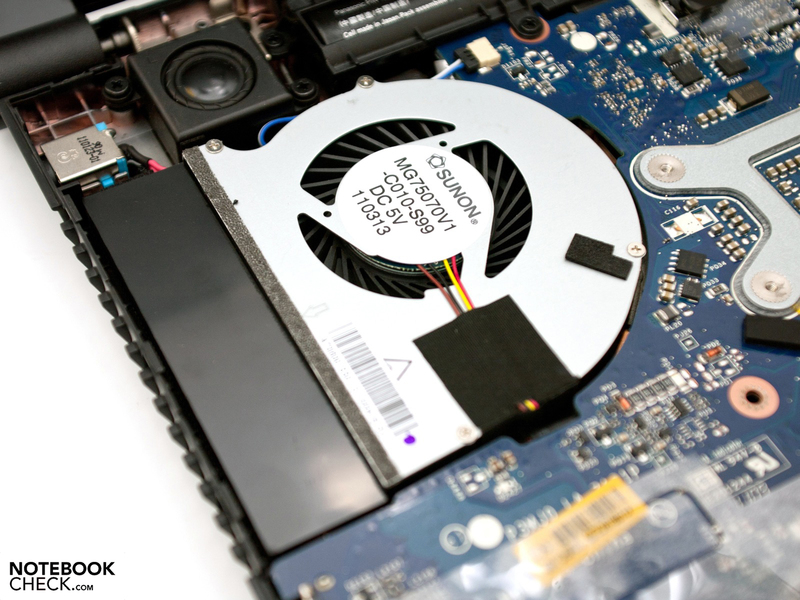 Aside from the hard drive, only a single fan is responsible for the noise produced by the 3830TG. Under typical office use, we measured 30 to 35.8 dB(A), on the lower end of which the fan remains inactive. But once the fan gets going during even low-intensity office work, it's rather noticeable. 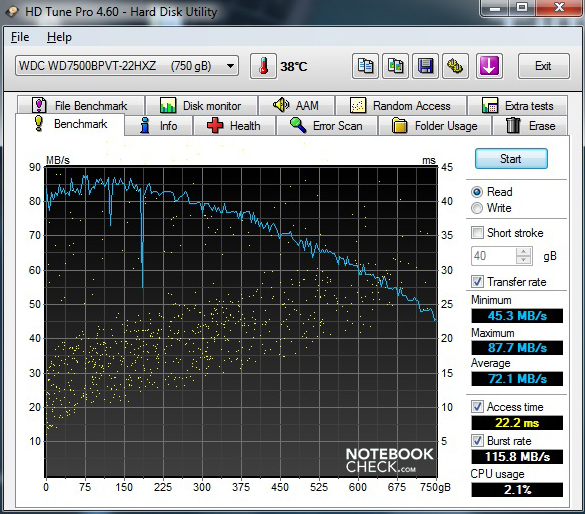 The slow-spinning hard drive only accounts for 30.5 dB(A), subtly humming in the background. We did not observe any clicking or clacking coming from the hard drive at any point. Under heavy use, the noise level rises to an clearly audible 40.2 dB(A). The good thing is, after closing out some resource-demanding programs and relieving the hardware of its stress, the fan quickly slows down and with it drops the noise level. 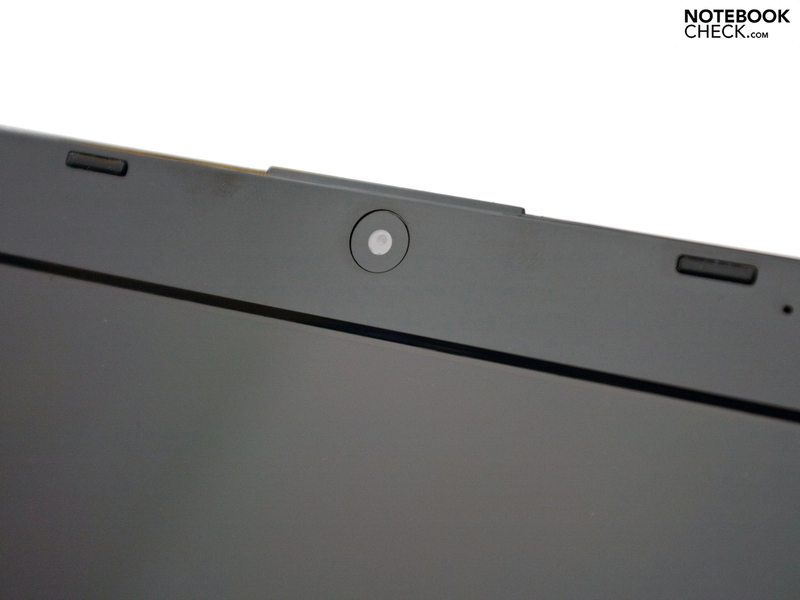 You can have a look at Acer's new cooling system by taking off the hatch on the base plate. Working with the fan, the copper heat pipes should provide for some good cooling. In idle mode, the case surfaces reach a relatively cool maximum of 29ºC, giving off a lukewarm feel. Under heavy use, the temperatures rise to fairly uncomfortable levels. We measured a maximum of 40.2ºC on top and 43.0º along the bottom of the base unit, which feels rather hot and can become uncomfortable to hold on your lap after a while. (±) The average temperature for the upper side under maximal load is 36 °C / 97 F, compared to the average of 30.7 °C / 87 F for the devices in the class Subnotebook. For your listening pleasure, there are two stereo speakers located just above the keyboard. The audio quality is poor and emphasizes the highs too much. The bass is present but too subtle. Especially when listening to music is the mediocre sound quality particularly noticeable, although much worse speakers have been known to be found in comparable notebooks. On top of that, the max. 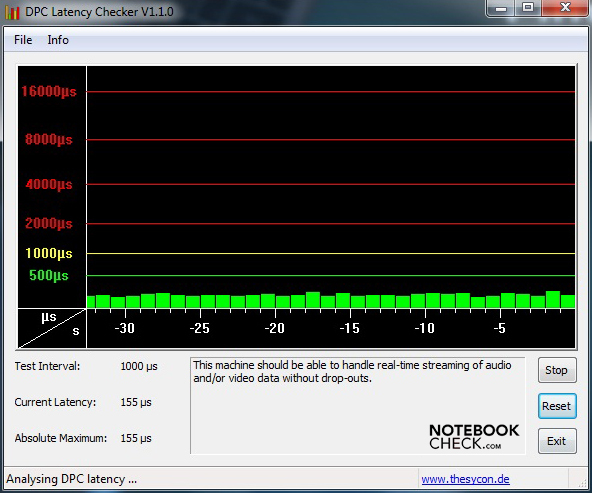 volume is not too high, but for it the audio doesn't sound distorted when the volume's cranked all the way up. The better way to go is just to use the headphone jack or HDMI output to hook up external speakers. The 3830TG impresses with it's relatively long battery life. 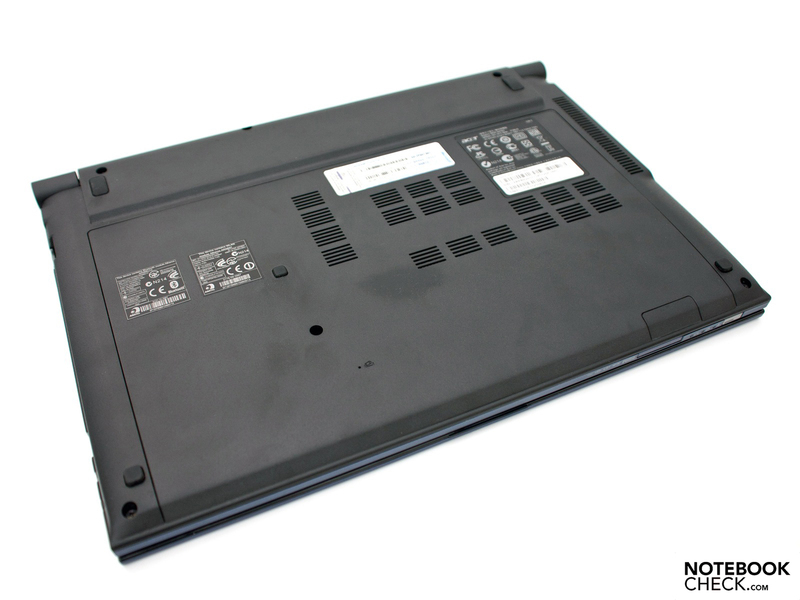 The 6-cell battery has a 66-Wh capacity, making it above average for subnotebooks. The downside is that it's not removable (all new Timeline laptops). Using the tool Battery Eater we measured the battery life in several scenarios. We started off with the Classic Test, that is: the system under heavy use, wifi on, and screen brightness all the way up. 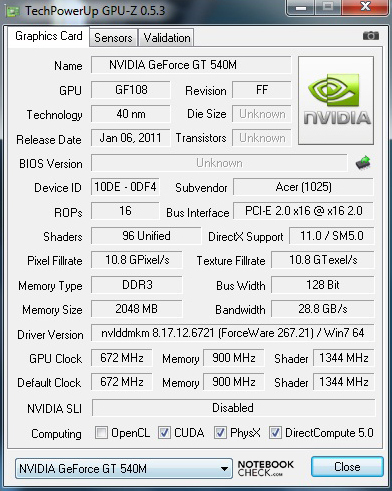 The dedicated Nvidia GeForce GT 540M—active during this test—contributes a good deal to draining the battery. After a relatively short 2 hours 33 minutes the battery is dead, making the 3830TG's shortest battery life pretty average for a subnotebook. At the other extreme we have the Reader’s Test. With minimum screen brightness and wifi off, we simulated the reading of a text document. Thanks to the energy-saver in the processor and the integrated GPU (GT540M deactivated), the battery life comes to a whopping 12 hours 7 minutes. Since this battery life does not reflect everyday use, we also performed the "Internet Browsing via Wifi" test. At 8 hours 14 minutes, you can get a whole day's worth of work done and then some (depending on the intensity of the tasks at hand). The power consumption in various scenarios is naturally (inversely) proportional to the battery life we measured. In idle mode as well as during light office work, a mere 9.3 watts are consumed—typical of even smaller netbooks of previous years—which accounts for the uncommonly long maximum battery life. Under heavier use, the energy consumption jumps from 42.8 watts all the way up to 79.9 watts when the Nvidia dedicated GPU becomes active. The power supply with a capacity of 90 watts can easily handle this level of stress. The Acer Aspire TimelineX 3830TG-2414G75nbb confirms the impression given to us by the other two new laptops of the same series we've reviewed. The keyboard, touchpad and classy ice-blue design make the laptop pretty appealing, but the case quality could use some improvement. Moreover, the positioning of the ports isn't too convenient and the glossy 13.3" screen irritatingly reflects its surroundings quite a bit. With its powerful hardware within a compact case for an attractive price of 799 Euro, Acer would otherwise have brought a very competitive subnotebook onto the market if it weren't for the CPU throttling under heavy use (gaming). 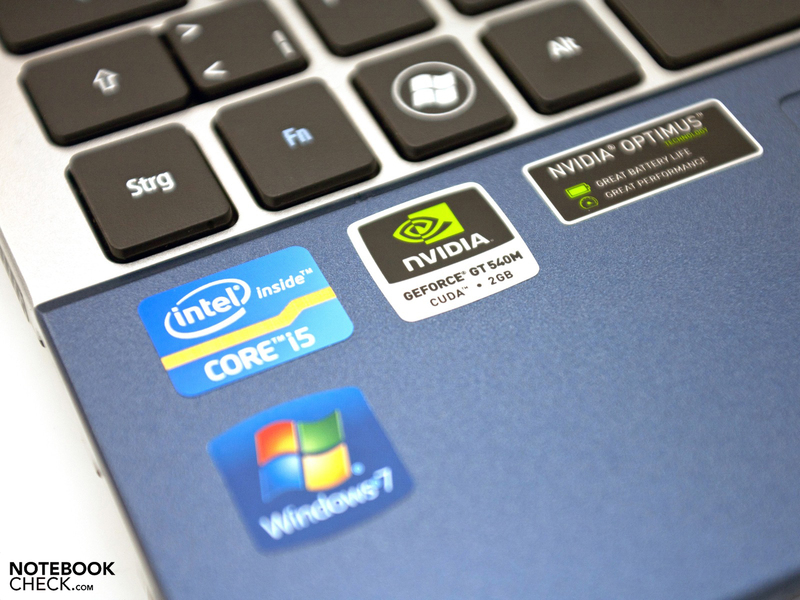 The laptop's severely reduced performance in this case might just be a deal-breaker for many. Acer has not yet come out with an update to solve the problem. 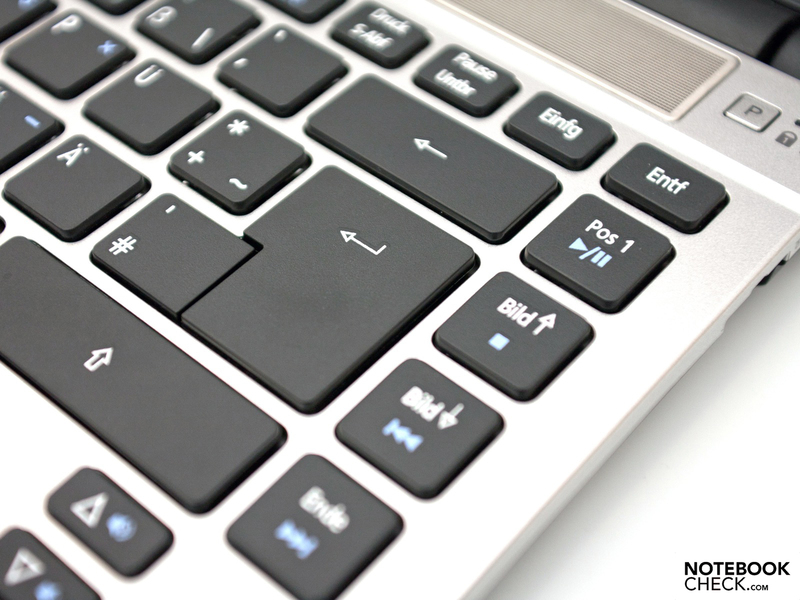 In idle mode and under light use, the laptop stays nice and cool but the temperatures soon reach critical levels under heavy use. On another note, the 6-cell non-removable battery keeps the subnotebook running for a relatively long time. All in all, Acer offers a rather attractive package that we can't recommend in all good conscience however because of the currently unsolved CPU-throttling issue. Other manufacturers offer similar subnotebooks that are more well rounded. The Acer Aspire TimelineX 3820TG of the previous generation—despite its older hardware—makes an overall better impression and is less expensive to boot. A large hatch takes up most of the base plate. Upon removing this hatch, you gain access to most of the hardware. The main memory (2x 2048 MB RAM) can be upgraded to total of up to 8 GB. 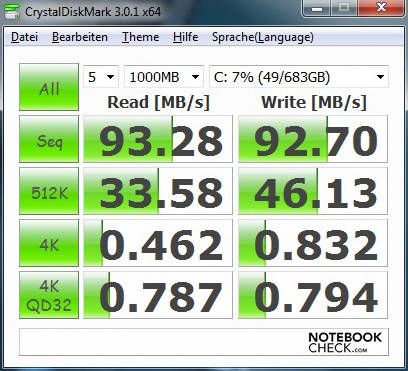 The 750 GB HDD shows average performance. 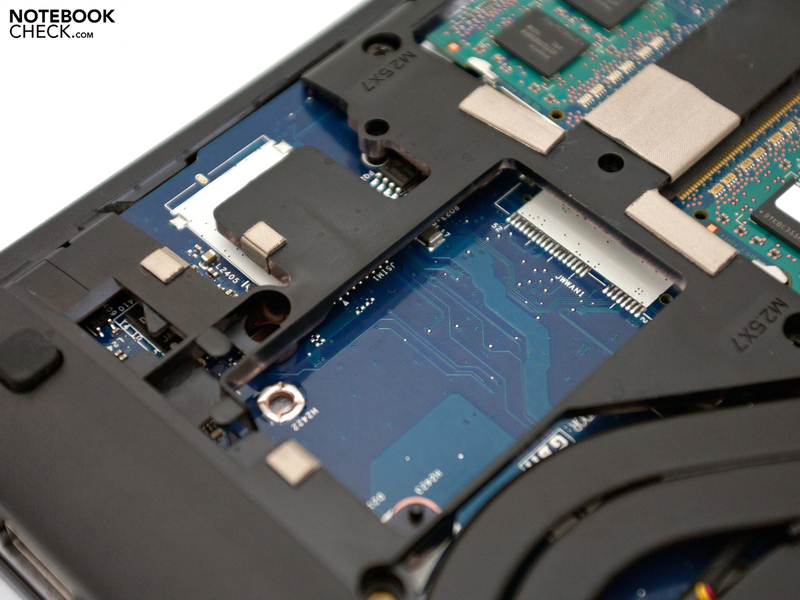 The Bluetooth module is located underneath the palm rest. A UMTS module is only available in the most expensive configuration. The speakers produce rather poor audio quality. ... the 6-cell, 66-Wh battery is not removable. 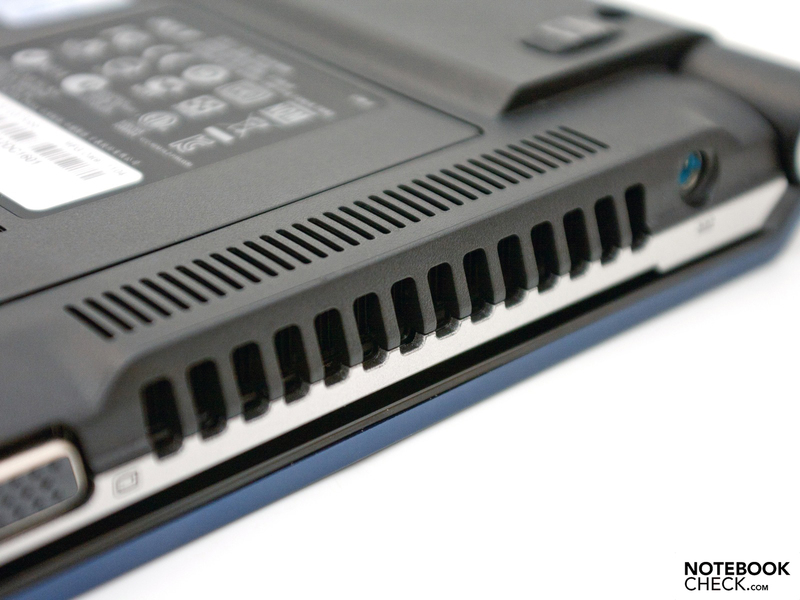 The many exhaust vents should keep the lappy nice and cool. 1.3 megapixels is enough for video chatting via Skype. It's amazing how far back the display lid goes and how tightly the hinges hold it in place. 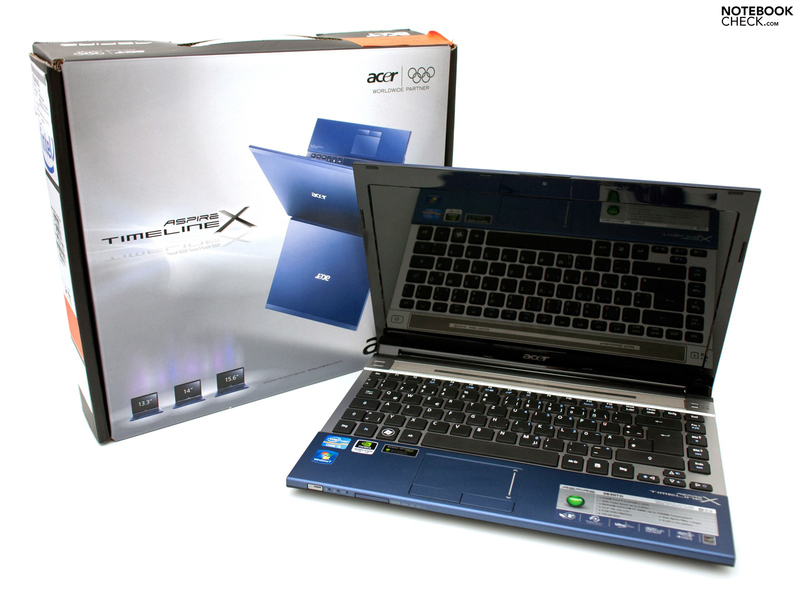 ...the smallest laptop of the new TimelineX series. True to the TimelineX tradition, the 3830TG comes in a cool "ice blue" design. On the inside we find newer hardware from Intel and Nvidia. The craftsmanship of this simple-design case is quite good. The matte case surfaces and aluminum display lid are a plus. Even when the laptop's off, charging peripheral devices via the charged USB 3.0 port is still possible. The headphone jack can also transmit S/PDIF signals. Along the front edge we have some status LEDs and a 5-in-1 card reader. The spongy keyboard bed and squished-together "Enter" and "#" buttons are uncomfortable to use. 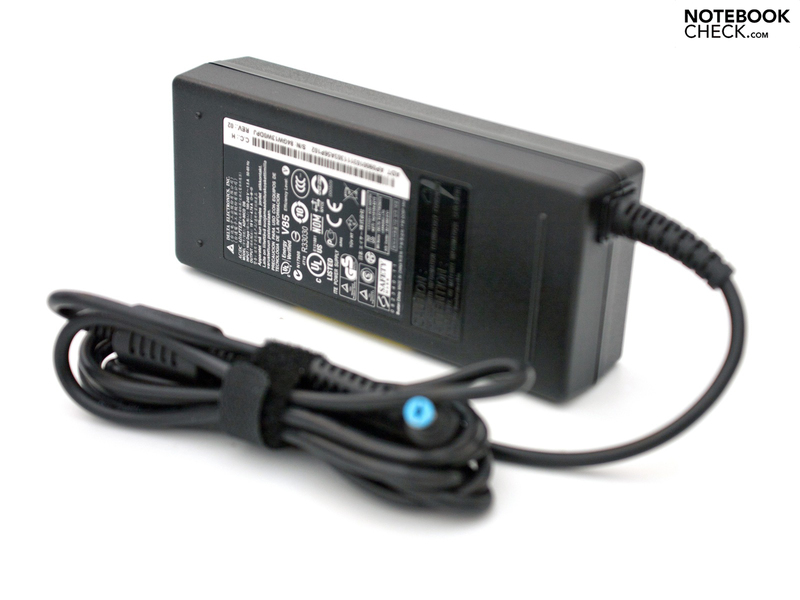 The power consumption measured isn't enough to overload the 90-watt power supply. 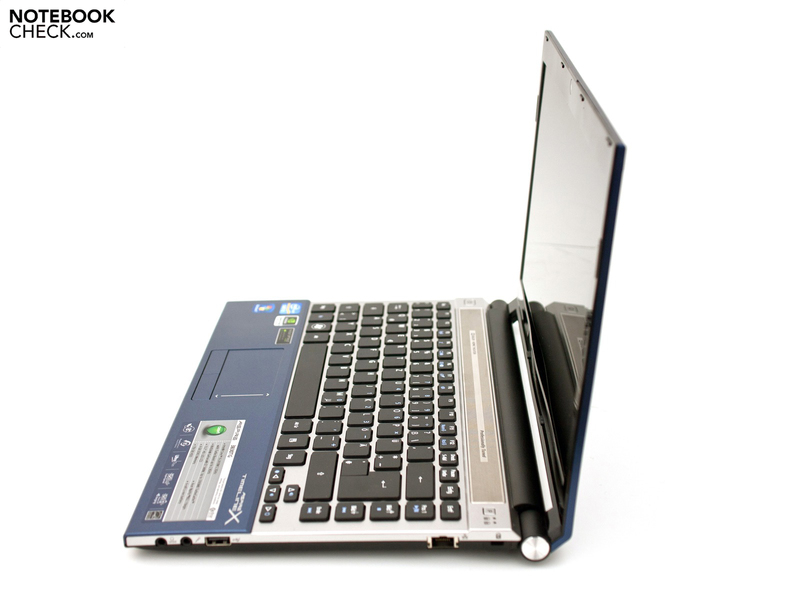 The attractive and compact design, the decent battery life and the good variety of ports. 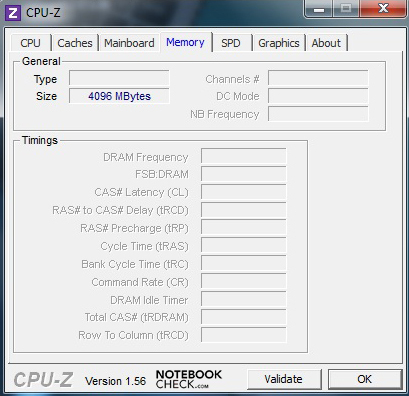 A quick and easy fix to the CPU throttling issue that at times lowers the laptop's performance to below that of comparable subnotebooks. How can a notebook whose selling point is clearly its performance get past beta-testing and make it onto the market with such a handicap to it's speed. 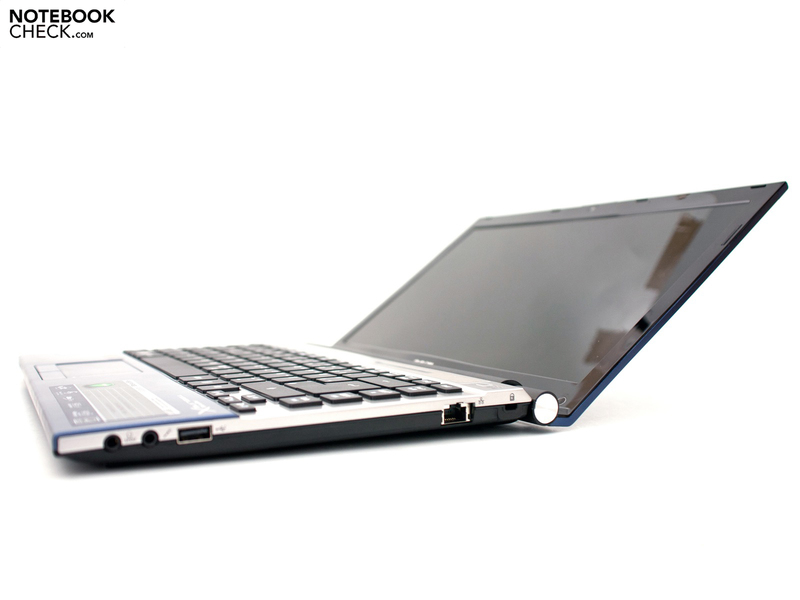 13.3" subnotebooks with up-to-date hardware and other positive qualities. 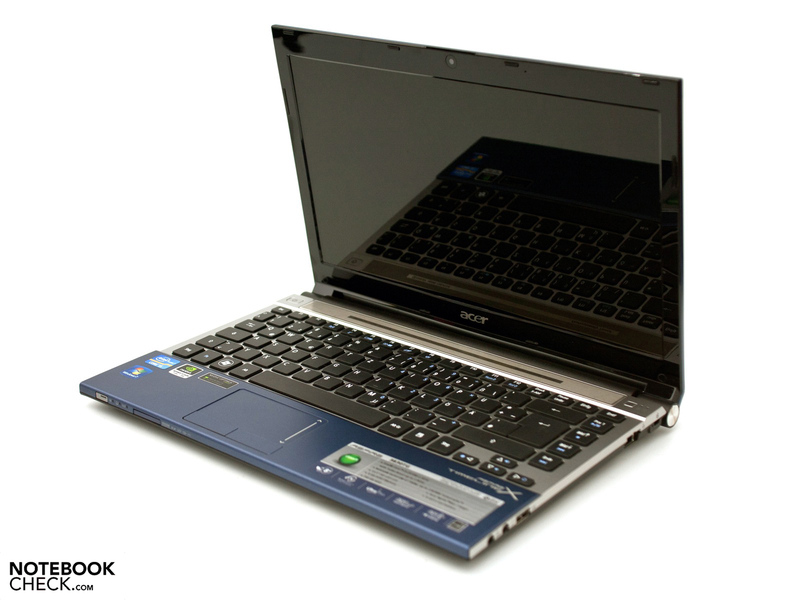 For example, the entry-level Acer Aspire 3750, the Asus U30SD-XA1, the Sony VAIO VPC-SB1Z9EB or the premium-grade Samsung 900X3A.